I can’t possibly leave the subject of the life of the 1st Duke of Northumberland without claiming a neat little piece of glory for the region. For the very famous Smithsonian Institute and all its related museums and educational centres throughout the US owes its very foundation to the man – or rather, the man’s son. Or, to put it more brusquely, the Duke’s illegitimate son. James Smithson – or Jacques Louis Macie, as he was originally known – was born in Paris in 1764 to one Elizabeth Hungerford Macie (nee Keate), following an affair with a prominent English landowner, Sir Hugh Smithson. Sir Hugh, who would eventually become the 1st Duke of Northumberland, was, at this time, married to Elizabeth Seymour, a Percy heiress, and had actually changed his name to Hugh Percy in order to inhert the earldom of Northumberland on his father-in-law’s death in 1750 – and would eventually be created 1st Duke in 1766. Heavily influenced by his mother’s side of the family (his father, Hugh, never acknowledged him), James took the scientific route, being elected to the Royal Society in 1787 aged only 22. In 1802, a little after his mother’s death, he changed his name from Macie to Smithson. He died in Genoa in 1829, his remains being later moved and reburied in Washington D.C. at the Smithsonian Institution Building. Astonishingly, James Smithson had never set foot in the US during his lifetime, and the reason for his bequest is unknown. 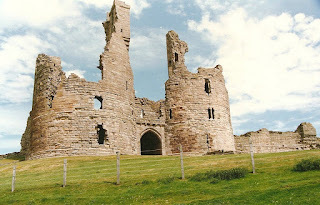 The previous blog entry concerned a Northumbrian beauty spot which held a special place in the hearts of the 1st Duke and Duchess of Northumberland. As it happens, the environs of Alnwick are strewn with such eighteenth century ‘picnicking areas’, if the history books are to be believed. It was designed, like Ratcheugh Observatory, by Robert Adam, in 1777 for the 1st Duke – a year after the death of the Duchess to commemorate her life (he had, after all, inherited his title through her line in 1750, lucky chap). 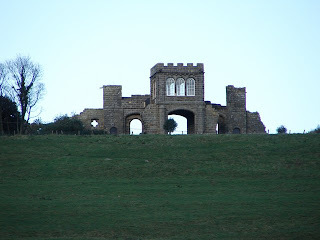 It stands 87 feet in height, and provides spectacular views of the surrounding parkland – itself laid out by ‘Capability’ Brown – but is nothing more than a folly. 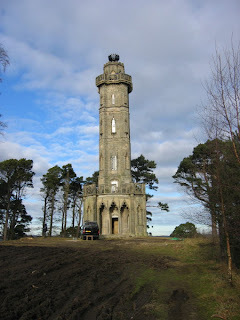 The tower has recently undergone repair after being placed on the English Heritage ‘at risk’ register. It is a Grade I listed building. 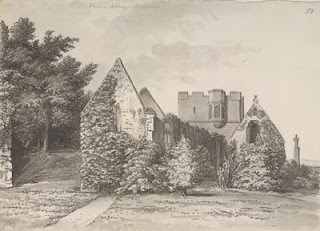 Hulne Priory (NU164158), though not an actual creation of the 1st Duke and Duchess (it was founded in c.1260), was most certainly added to by them both before and after the latter’s 1776 death. For once, the Duchess would at least have been able to enjoy her summer days in and around the old place, much as tourists do today. But to get there you’ll have to walk! Hulne Priory: church in foreground, tower behind. Finally, there is Heiferlaw Tower (NU183177), built in the late 15th century for the monks of Alnwick Abbey – most probably as a lookout and/or beacon to warn of Scottish raids. It is built in the style of a bastle: animals/storage at ground floor, accommodation above. After the Duke & Duchess had finished using the place for their leisure purposes, it came back into use, briefly, as a lookout point during the Napoleonic Wars. There’s a nice pic of Heiferlaw Tower here , from where you can access plenty more information on all of the abovementioned sites. In 1940, at the height of the German bombing raids during World War II, land was requisitioned from a local farmer by the War Department and Northumberland County Council was tasked with the construction of a dummy airfield near the village of Boulmer on the North-East coast. Within weeks, grass runways had been cut, plywood and canvas ‘aircraft’ assembled and several false outbuildings erected. The idea was to draw the Luftwaffe away from ‘proper’ bases nearby, such as RAF Acklington a few miles to the south. And it worked. Two raids are recorded at Boulmer, one each in 1940 and 1941 – both of which caused considerable damage. However, information thereafter came to hand that the Germans had pretty much sussed Britain’s cheeky nationwide subterfuge, and the decoy airfield network was not maintained beyond late 1942. It therefore seemed as if RAF Boulmer’s days were over as the government changed tack. However, in March 1943, the airfield was back in favour as its conversion into a fully-fledged airfield began. Three runways and a scattering of outbuildings were laid out, the new RAF Boulmer acting as both a satellite airfield to RAF Eshott (near Felton) and a training base. The end of hostilities in 1945 brought the closure of the complex; but the onset of the Cold War saw the airfield resurrected yet again. A new Operations Site was built a little to the west of the old base (with a number of the old buildings being recycled), and from 1953 RAF Boulmer once again became a valuable link in the UK’s defence system as an Air Defence Control Centre – high powered radars and all. And it still plays an important monitoring role to this day as a NATO Control Reporting Centre, with responsibility for the 24-hour surveillance of UK airspace. Aircraft operations proper did not return until 1978 when a Search & Rescue Team were relocated there after the closure of RAF Acklington. Sea Kings continue to whirl out of RAF Boulmer to this day, as over 1,000 staff man the various operations based there. Charles, 2nd Earl Grey, is famous for (a) being the architect of the Great Reform Act of 1832, (b) a blend of tea, and (c) having a thumping great monument in his honour slap-bang in the middle of Newcastle. He lived from 1764 to 1845, his ancestral home being Howick Hall on the Northumberland coast. As prime minister during 1830-34, he oversaw the passing of perhaps the most famous act in British parliamentary history, when his Whig government saw off stiff opposition from the Duke of Wellington to effect the passing of the Great Reform Act. To say nothing of the Abolition of Slavery Act a few months later. As a tea enthusiast, he received his special blend as a gift from a Chinese mandarin to suit the water from the well at Howick, using the oil from bergamot orange rind to offset the taste of the lime in the water. Lady Grey used the tipple in London when entertaining, and it proved so popular that she was asked if it could be sold to others – which is how it came to be sold worldwide. The Greys, however, failed to properly protect their ‘invention’ and did not make a penny from the tea's astonishing success. As for Grey’s Monument in Newcastle, this was raised in his honour in 1838, and it still stands to this day, proudly dominating the cityscape at the head of Grey Street – itself recognised as one of the finest thoroughfares in the country. Grey spent much of his life at Howick Hall, including the last 45 consecutive years of his eventful existence. 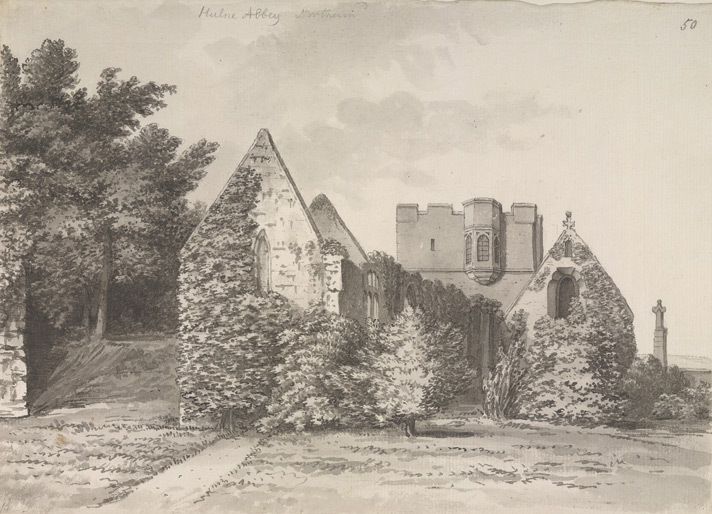 The beautiful gardens are today open to the public (the hall is closed for the time being); but perhaps the most curious of Grey’s legacies is a little building which lies about a mile to the east of the hall on the very edge of the sea. 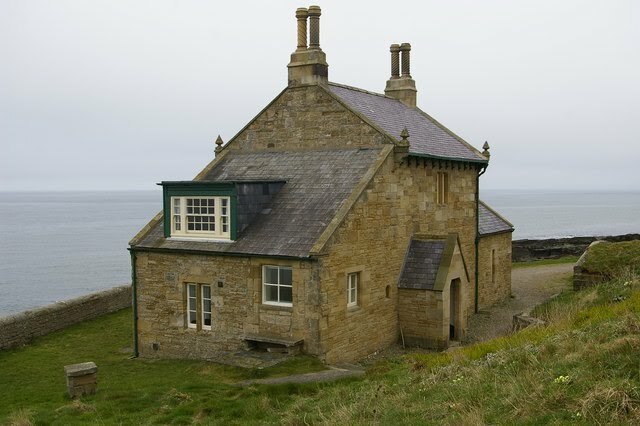 Constructed in the seventeenth century and altered in Earl Grey’s heyday, The Bathing House was used by the Earl, his wife and their 15 children as a private changing room for their lazy days by the sea. Stone steps were cut into the rocks leading down to a quarried-out rock-pool and private beach. It is now used as a holiday cottage. Craster (and Seahouses, for that matter) is famous for its kippers – herring (or salmon) fish cured by splitting open, salting, and drying in the open air or smoke. This process of preservation means that the fishy results can be transported long distances before consumption, this usually being via a short grilling for breakfast. The etymology of the word is a curious one, with a connection, it seems, to the modern-day slang for a short sleep – as in ‘having a kip’. Chronologically, it is difficult to say which came first: the kipper or the kip. The explanation which follows is therefore somewhat circuitous, seeming in places to fall back and in on itself. But I shall have a go. We’ll start with ‘kipper’, whose meaning is as per above (noun, as in ‘a kipper’, or verb, as in ‘to kipper’). There is an argument which states that the word is derived from the Old English kippian, to spawn; which may be connected to the ‘kip’, or small beak, that male salmon develop during the breeding season. The word kip, kippen or kippa seems to have also generally meant ‘to catch’ across several ancient European languages; similarly, the English kipe denotes a basket used to catch fish – and this ‘catching’ variant of the word seems to go back many centuries, so it could be the original source of the term. Quite how the terms for the fish ‘beak’, the catching process and then the fish itself came to be related to the curing process of ‘kippering’, though, is not clear. There is a clue, perhaps, in the Danish word kippe, meaning a doss house or hut, which just happens to be the word used to describe the ramshackle sleeping accommodation of the women who used to work on the fish in Craster (viz. ‘kip houses’). And, so the argument goes, because these horrible places were only fit to sleep in, this is where we get the phrase ‘having a kip’ from, when we mean to have a sleep. So does the word ‘kipper’ (noun and verb) come from the women who slept in the ‘kips’, which was a Danish word, originally? Or does it all start from the old European kip/kippen/kippa, meaning ‘to catch’? I have successfully managed to completely confuse myself … and very probably you too. Talking of kips, I think it’s time to have a lie down. One stormy winter’s night as the skeleton of Dunstanburgh laboured through another of its strenuous battles against the wicked Northumbrian elements, there came to the doors of this desolate fortress the gallant knight, Sir Guy. Unable to gain entry, the pathetic figure of Sir Guy settled himself as best he could in the porch and prepared for a long cold night. As he sat watching the storm, unable to sleep, there was a huge crack of thunder on the stroke of midnight and the castle doors burst open. In the doorway there stood a huge figure of an old man, bathed in flames, with a flowing robe and a long, white beard. As Sir Guy stood transfixed, the old wizard extended a crooked, beckoning finger and the brave knight crossed the threshold. After passing through a labyrinth of passages filled with eerie sounds and strange creatures they passed into a huge, dimly-lit subterranean hall. A hundred black steeds and their white knights lined the walls, spell-bound, and opposite Sir Guy there stood two giant skeletons guarding a crystal tomb, within which lay a beautiful young woman in a deep sleep. One skeleton held a sword, the other a horn, and only a courageous knight brave enough to come thus far and to then make the correct choice between the two could break the spell, he was told. After much thought Sir Guy chose the horn and, as he blew, the hall came to life. The knights awoke and the horses reared excitedly. The girl, too, awoke for a moment then passed sadly back into her deep sleep. Whereas he might have bravely taken the sword, he had selected the horn – a symbol, even if he did not realise it, of a cry for help. He had, of course, made the wrong choice. The resounding sound of an evil cackle of laughter filled the hall and darkness descended, Sir Guy collapsing unconscious. Waking in the porch the following morning he frantically re-entered the castle and searched its corridors for the enchanted hall and its sleeping beauty, but nowhere were they to be found. It is said he continued his search until his death, and that his ghost continues the search to this day. 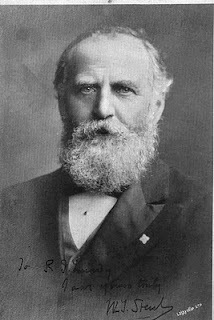 William Thomas Stead (above) is generally regarded as the father of modern journalism – and, many say, of all its ills. He wrote widely, profusely and usually in a sensationalist manner. He was also a native of Embleton, Northumberland. The son of a Congregational minister, W T Stead was born in the summer of 1849. He lived for a time in Howdon-on-Tyne and was schooled in Wakefield, then found himself back in the North-East as an apprentice in a Newcastle merchant’s office. Quickly branching out into journalism, he worked for some time as editor of the Northern Echo, before advancing to London’s Pall Mall Gazette – becoming its editor in 1883. During his six-year tenure he made quite an impact in journalistic (and political) circles, where he developed his characteristic investigative style and championed the use of the interview. He was often accused of ‘creating’ the news rather than reporting it. From 1885, he threw his weight behind the campaign against child prostitution; his ‘staging’ of the purchase of a young girl from her mother landing him a jail sentence. The great ‘Crawford Scandal’ of 1886 also attracted his attention. In the 1890s he turned his mind to many new and different spheres of writing during an enthusiastic period of reforming vigour. He was a pacifist, a psychic researcher and a great visionary – his reforming ideas and ideals often years ahead of their time. He claimed to be in contact with the spirit world, and was said to have hinted at the mode of his death on several occasions. The nature of his demise – aboard the Titanic in 1912 – was typical of the man. He was on his way to a peace conference in the US when the iceberg struck, and Stead dutifully helped several women and children into lifeboats. He then retired to the 1st Class Smoking Room where he settled down with a book, no doubt mindful of his deathly premonitions. A later sighting has him clinging to a raft with John Jacob Astor IV, the wealthiest man on the ship, the pair of them relinquishing their grips after they became frozen, Leonardo DiCaprio-style. His body was never recovered. It was widely rumoured that he was due to be awarded the Nobel Peace Prize for his pacifist work, until his fateful trip intervened. Among the rocky protuberances in and around Embleton Bay lies a famous lump of sandstone known as ‘The Vanishing Rock’. As the tides come and go and the sands shift to and fro, so this feature moves into and out of view, as befitting its name. Nothing unusual in that, you may think; but this particular rock has the name “Andra Barton” (among others) chiselled into its surface, in rough but distinct lettering. Sir Andrew Barton was High Admiral of Scotland around the turn of the 16th century, who, acting under the protection and in the name of the Scottish Crown, made something of a nuisance of himself to the Portuguese and the English upon the high seas. In short, he was considered a pirate by non-Scots, or a privateer, at best. He was defeated in battle with the English in 1511 – some reports have him slain in the fight, others that he was captured and beheaded. The loss of Barton did not go down well with the Scots – one of many grievances which led, eventually to the clash at Flodden in 1513. As for the ‘Vanishing Rock’, I shouldn’t rush to Embleton’s sandy expanse hoping to catch a glimpse. For the last time it was seen was in 1974.